Captain: The channel's here on the chart, all right, and so are the marking lights. First Mate on Yacht: Then what's wrong with them? Captain: Those lights don't seem to be in just the right place. They're both a bit out of position according to this. First Mate on Yacht: Two light buoys means a safe channel between the world over! Captain: "Safe between the world over" doesn't go in these waters. Q: Is this movie based on a book or previously released material? THE MOST DANGEROUS GAME (RKO Radio, 1932), directed by Ernest B. Schoedsack and Irving Pichel, from the short story by Richard Connell, is a highly suspenseful drama with a neat twist in theme. But for the benefit for those who have never read Connell's original story nor seen the movie, this is something to really consider, especially for action and adventure fans. Categorized as a horror film, the only horror is the thought of a hunter being the hunted, especially by a crazed individual. The story begins with an explosion and the sinking of a yacht with Robert Rainsford (Joel McCrea) becoming the sole survivor of the perished crew. He swims to safety on a remote island and soon encounters an ancient mansion where lives the Russian Count Zoroff (Leslie Banks), and his muted servant, Ivan (Noble Johnson) and Tatur (Steve Clemento). After getting into some dry clothes, Rainsford is introduced to Zoroff's other guests, Eve (Fay Wray) and her brother, Martin Trowbridge (Robert Armstrong), also shipwreck survivors. Gathering in the living room, Zoroff discusses his interest in game hunting, but instead of hunting animals, which now bores him, he hunts his new interest - a most dangerous game. Later that night, Zoroff has made the drunken Martin his latest prey, and after returning from his all night hunt, Zoroff shows Eve and Rainsford his trophy room, consisting of human heads and corpses, with Martin's body being among them. Because Rainsford is a noted author and hunter, Zoroff wants him to go game hunting with him, the hunting of man. Refusing to take part in his mad scheme, Rainsford, in turn, becomes Zoroff's next prey. Zoroff promises that if Rainsford eludes him until sunrise, he and Eve are set free, and if he doesn't, gets to recapture Eve alive, since he doesn't hunt the "female animal." Being given a 12 hour head start for preparation, Rainsford, with Eve's help, works against time using his brains instead of his feet to try and outsmart the hunter, but after midnight, the hunt begins, with Zoroff's tracking them down with weapons ranging from bow and arrow, rifle, and, as the last resort, the release of his vicious dogs, climaxed by surprises for both hunter and the hunted. THE MOST DANGEROUS GAME ranks one of the very best stories ever transferred on screen. In spite of alterations to Connell's original story, such as adding a female to accompany Rainsford, this adaptation is a fast-pace 65 minutes that never lets up for a minute. The first half hour devotes itself to character study, with Robert Armstrong's drunken performance somewhat slowing down the pace instead of providing humor. However, second half of the movie is tight on suspense, with the camera capturing every move and reaction from the three central characters, with Max Steiner's underscoring setting the mood and pace. Of course there's plenty of close calls and near misses to add to the excitement, making this a well staged and truly memorable experience after it is all over. What makes THE MOST DANGEROUSGAME worthy is the uncanny performance of British actor Leslie Banks, in his Hollywood debut, hamming it up to perfection, making his insane hunter come to life as intended by the author. Closeups of his eyes during the hunt is truly effective. If the jungle settings look familiar, it's the same set used for the much more famous adventure, KING KONG (RKO, 1933), that also features Fay Wray and Robert Armstrong. 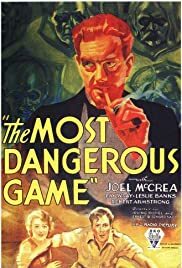 While Joel McCrea has been on screen since the silent era, starting from small roles to the elevation of leads, THE MOST DANGEROUS GAME showcases him to best advantage, but cannot take away from the performance of Leslie Banks. While never a high rank leading man, McCrea did become a Hollywood survivor, better known for westerns, retiring from his successful career by 1962. THE MOST DANGEROUS GAME was remade as A GAME OF DEATH (RKO, 1945) with John Loder and Edgar Barrier; RUN FOR THE SUN (United Artists, 1956) with Richard Widmark, and recycled numerous times, but none have captured the greatness to the 1932 original. It's also interesting to note that the theme was used as the basis in one of the better episodes to the comedy series, GILLIGAN'S ISLAND, titled "The Hunter" with Rory Calhoun guest starring as the title character who hunts people, namely Gilligan (Bob Denver).